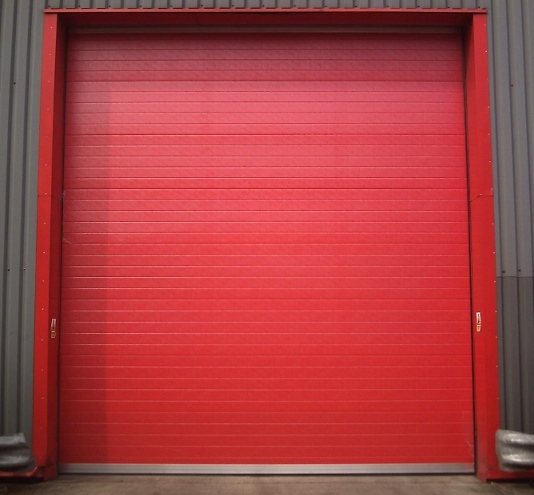 Insulated sectional overhead doors give thermal performance greater than required by building regulations, avoiding cold bridging compared with traditional roller shutters. Windows can be installed in single or multiple panels. Panels can be prefinished in an extensive range of colours and materials. Doors accidentally damaged can be easily repaired using replacement materials and components. Insulation is afforded to the whole door area – even at joins. 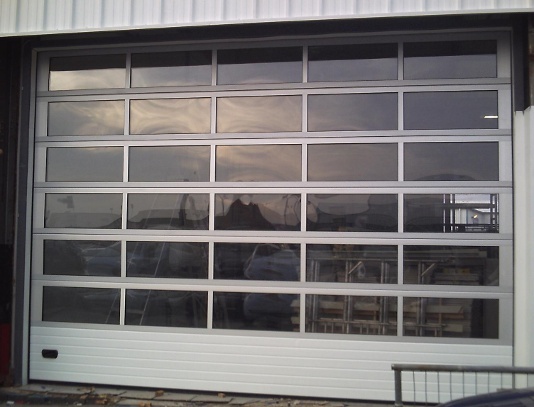 The door panel provides the overall Insulated Sectional Overhead Door assembly with its main characteristics and therefore the following detailed information is provided to assist when the door performance needs to be explained. The use of quality materials and precise manufacturing controls ensure long service life in normal industrial and commercial applications. All Insulated Door Panels conform to the Building Regulations requirements for Industrial Doors, and the durability of finishes are those specified by Corus technical specifications department. 0.5mm hot-dip galvanised steel to BS EN 10147: 1992 (specification for continuously hot-dip zinc-coated structural steel sheet and strip) grade Fe E220G, coating weight 275g/m2 . 39mm thick rigid polyurethane foam, density 40kg/m3. Low density compressible foam, factory applied. The 1995 edition of Building Regulations Approved Document L ‘Conservation of Fuel and Power’ defines the ‘U’ value requirement for Vehicle Access and Similar Large Doors as 0.7 W/m2K. The Document states that thermal bridges should be taken into account when calculating ‘U’ values. The thermal performance of standard 610mm wide and 40mm thick Insulated Door Panels, including the effect of thermal bridges at panel to panel joints, has been calculated by the finite element method giving a ‘U’ value of 0.60 W/m2K. The outer skin can be finished in British Steel’s HPS200, Pvf2. or in architectural polyester. HPS200 colours have a scintilla finish. Pvf2 and polyester finishes are all stucco embossed as standard. The internal liner skin is finished in white, polyester coated, stucco embossed galvanised steel as standard. A stucco embossed O.7mm thick aluminium outer and inner panel is available which has the benefit of reducing weight but with the same insulation properties. A separate list and sample swatch of the current colour range is available from our Customer Services department. It should be noted that when a door is due to be positioned where it is likely to receive direct sunlight then dark colours should be avoided due to the potential ofthermal bow. Contact our Technical Department for further information. The facing materials used on Composite Panels, when tested independently, have a Class I surface spread of flame to BS 476: Part 7: 1971, and Class 0 as defined by the Building Regulations 1985. The 40mm insulated door panel gives sound reduction of (Rw) 25db. Please note; this is for the panel only, and does not include joints, i.e. a fully installed door. A range of windows in various sizes can be incorporated in the panel, the standard being 600 × 300mm with radiused corners. Each panel is fitted with pre punched galvanised steel end caps and the top and bottom panels are finished with an aluminium retainer which holds the top and bottom EPDM seals. A range of locking options are available and a foot step handle is supplied as standard. Wicket doors are available 800 ×100mm approx. 150mm above floor level, supplied complete with cylinder type locking. Standard lift, high lift, vertical lift and low headroom track configurations. Follow the roof and pitched tracks available. Note: We do not supply fixings for use between the door and the structure.